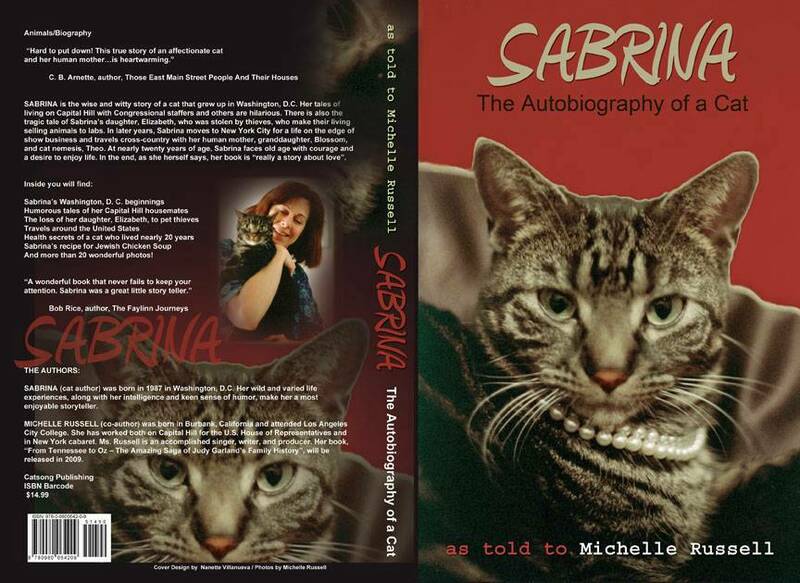 The Autobiography of a Cat"
"Sabrina," as told to Michelle Russell, recalls the amazing life of a cat who lived nearly twenty years. From her early memories on Capitol Hill to her life in New York and the Pocono Mountains of Pennsylvania, Sabrina's tales are funny, wise and completely entertaining. Throughout the book, Sabrina shares her views on prejudice, health, angels, old age and other matters. In the end, she tells us, "it is really a story about love." "Sabrina" is a book that is loved by everyone who reads it . SABRINA: THE AUTOBIOGRAPHY OF A CAT is on sale for half-price now! $7.00 plus $3.00 postage & handling (MN residents 6.875% sales tax). 180 pages and 50 images. You won't forget Sabrina's story! Vendors contact us for multiple books. "I was born in Washington, D.C. in May of 1987. Of course, I don't remember that, nor do I remember my cat mother or my brothers and sisters. They are only shadowy dreams to me. My first memory is of being alone in a garden. There was a jungle of grass, and other plants towering over me. I was so tiny, all I could do was cry in my loudest voice, "Meooow! Help! Mother, where are you?" After dinner, it was time to play. I would run from room to room, and when my legs got longer, up and down the stairs like a maniac..."
I will never forget the day I woke up to my mother's scream. Theo had caught a little mouse, which had come through the hole in the floor and he was throwing it through the air. My mom didn't want him to kill it or eat it; so, she took it from him in a paper and tried to stuff the half-dead mouse back down through the hole. Mom and I began a new kind of communication - a language beyond words. It went like this: I would tap her twice with my tail, and she would respond in kind with her fingers... Later we would go up to six or more taps. In time, when I felt better I would sometimes play with her and make her wait for my answer. Just when she though I had not gotten it, I would give her the exact number she had give me, back again."